RUSH: President Trump is wrong in his Facebook post from last night. This is not a “witch hunt” that’s going on here, and Democrats know exactly what they’re doing. They know exactly what they’ve got. The Obama administration left all this stuff in place for ’em to use. It’s not a witch hunt. There is the execution of an attempt at a peaceful coup. A peaceful coup to oust Donald Trump is what we are witnessing. It’s been orchestrated by Obama and the Democrat Party. It’s that simple. It is not a witch hunt. They’re not blindly hoping they find things as they open doors. They know what’s behind the doors. They put the stuff there! Now, look, while all of this is going on, there are other things happening that are not even showing up on the back page. Speaking euphemistically. There aren’t any back pages on websites and TV broadcasts. But it’s being shelved back to the back. That’s what’s being done to the Obamacare repeal. Rand Paul is trying to bring people’s attention to it and it’s tough to crack through. I just wanted to mention this to get it out there and I hope to circle back to it, but a bunch of Republicans, senators who really now… It’s a House bill, so senators literally are not entitled to see it. So Rand Paul’s not being denied anything here, but he does have a vested interest in Obamacare being completely repealed and replaced. And there is a repeal-replacement bill somewhere. It’s behind locked doors, it’s under lock and key, and the Republican leadership isn’t letting anybody see it. Nobody knows why, but the informed speculation is that it doesn’t do much, that it is being called “Obamacare light” and really isn’t going to make much of a difference at all. And that is why the Republican leadership doesn’t want anybody seeing it right now. There’s even a couple allusions to the fact that there might be a couple entitlements in it as part of the replacement. So, things that also matter are out there and are happening, and they’re taking place while everybody is looking at this other stuff. Now, this is not a diversionary tactic. This stuff is real here. This coup, this silent coup that is taking place is real. I’m not suggesting that the Obamacare repeal people are using all this as a diversion; it’s just what’s happening. Jeff Sessions should not have recused himself. He’s got nothing to be defensive about. He didn’t do anything wrong. He certainly should not resign, which is now what the Democrats are asking, which was predicted. Everything — virtually everything — that has led to Jeff Sessions recusing himself from whatever investigations there are into the Russians hacking the election is fake news. The questions that Al Franken was asking Senator Sessions during his confirmation hearings were based on a fake news story, that now famous dossier made up of totally fraudulent, phony allegations about Trump — such as hiring prostitutes to urinate on the bed in the Moscow hotel that Obama and Michelle had slept on. Totally false, fake. Questions are being asked of Sessions about that, and it all just descends from there. Fox News reported moments ago that, you know, Sessions met with the Russian ambassador twice, and “Obama Administration Officials Set Up Jeff Sessions’ Meeting With the Russian Ambassador…‘” It happened in 2016. “It turns out [Senator Sessions] spoke to the Russian ambassador on the invitation of the Obama administration. '” You can read this at TheResurgent.com. Fox News, here: “The first came at a conference on ‘Global Partners in Diplomacy,’ where Sessions was the keynote speaker. “Sponsored by the U.S. State Department, The Heritage Foundation, and several other organizations, it was held in Cleveland during the Republican National Convention. The conference was an educational program for ambassadors invited by the Obama State Department to observe the convention. The Obama State Department handled all of the coordination with ambassadors and their staff…” This ambassador, this Russian ambassador has been to the White House countless times, as ambassadors do. I’m gonna tell you the first lie. The first lie is that Donald Trump loves Vladimir Putin. The second lie is that Vladimir Putin loves Donald Trump. The third lie is that Putin and Trump have had numerous dealings together because of this mutual bromance that they have, and Trump and Putin are cooking up all kinds of things to benefit Trump personally. Lie number four: Because they want all of this, Trump and Putin worked together to hack the election to deny her rightful victory to Hillary Clinton. Those are the lies that establish everything else that follows. The truth of the matter is if you want to get to the real Russian link — if you want to discover what the real Russian link to be investigated is — it is the Russian link to Obama. We’re in the midst of an out-of-control insanity. We’re in the midst of a news cycle, the details of which I don’t think even most of the Drive-Bys even are clued in about. They’re just reporting it by rote as it is leaked to them, as it is handed to them. But if there’s any sabotage going on here, it starts with Barack Obama and the Russians. Now, the first lie… How many of you are under the belief because of what you’ve heard in the news that Trump and Putin love each other? Putin loves Trump, Trump loves Putin, and they’ve had dealings, and they’ve got private affairs going on back there. They’ve been making money with each other, deals, whatever it is. You’ve heard that Trump did not criticize Putin, and you’ve heard that Trump responded very unfavorably when he thought Putin complimented him and praised him. What he meant was, “Look, after I win the election, I can’t run again. I’m not gonna have to worry about ever running again so I can do all kinds of stuff; I’ll be much in more flexible.” The conversation was about reducing United States nuclear weapons. Not reducing Russia’s nuclear weapons. It was about reducing the United States’ stockpile, and Obama told Medvedev, “You tell Vlad I’ll be a lot more flexible after the election.” The Russian ambassador, if you must know, is a lobbyist. All ambassadors are lobbyists. That’s how you have to look at them. They show up and they lobby for their countries in every which way you can imagine. Policy understanding, policy cooperation, trade deals, money, you name it, they’re everywhere. The idea that the Russian ambassador talking to and Democrats is some kind of a crime is absurd. But when the Russian ambassador is talking to Republicans it is a crime today. You know why? Because of what started all of this. And that is the Russians worked with Trump to hack the election, to interfere and to deny Hillary what was her rightful election to the presidency. And so since… And there’s no evidence for this. They haven’t still found any evidence because there isn’t any because it couldn’t have happened. But since everything in this story is fake news, everything about it is fake news, there never will be any evidence to this — and it’s very difficult to prove a negative. But they’re never gonna be able to find the evidence to prove that there was this kind of cooperation between Trump and his campaign and the Russians to screw Hillary. It just doesn’t exist. They’re never even gonna be able to prove that the Russians succeeded in altering what was to have been a Hillary win. They will never be able to prove that because it didn’t happen. But that’s the foundation under which or on top of which all of this is being built. So when Republicans are meeting with the Russian ambassador, “Weeeeell, we ought to be suspicious of that because look what the Russians did with the Trump campaign to screw Hillary!” You see? So this is… This is… It’s surreal to watch this, because every bit of this is fake news. In fact to the extent that the Democrats are making allegations, it’s they who are guilty. I don’t know how many times I have mentioned this story; I’ll mention it again. In fact, J. Christian Adams has written about it today, PJ Media. Ted Kennedy back in 1983… We know this because o when the Soviet Union imploded, a bunch of KGB files ended up being released. And we learned that Ted Kennedy, Senator Ted Kennedy, prominent Democrat, in 1983 was sending letters and having meetings, phone calls to prime ministers and presidents of the Soviet Union, like Yuri Andropov. And they were hatching a mutual strategy to get rid of Reagan in 1984. Ted Kennedy was doing everything he could to sabotage Reagan’s reelection, and he was asking the Soviets to be patient in their dealings with the U.S. because it wouldn’t be long and they’d be able to get rid of Reagan and then things would return to normal. In fact, there has been collusion between the Soviets (i.e. the Russians) and Americans in trying to rig an election, except it happened in the eighties: Ted Kennedy and the Democrats trying to sabotage Reagan. There is no evidence that what is being alleged today has even happened because it didn’t. Now there’s news that, “You know what? Trump’s son-in-law met with the Russian ambassador!” (Gasp!) “No! Really? Wow, what an accusation!” So the Drive-Bys are just panting over this. The (panting) tongues are on the floor with anticipation, and they think they’re getting closer and closer to forcing Trump to resign without even having to go through with impeachment! So, my friends, make no mistake. I think even I, ladies and gentlemen, didn’t quite see the full scope of what is going on here. I don’t think that this is about just delaying Trump’s cabinet and causing him some irritation, this kind of thing. I think what is happening here is a full-fledged effort here to deny Trump the actual control of governing, of the government, by leaving so many Obama career people appointed, by going so slowly on confirming Trump’s cabinet appointees and other lesser bureaucratic positions that remain open and haven’t been filled. And that’s why it appears the Democrats are still running the show. That’s why it appears even though the Republicans and Trump won the election, if you pay attention to Drive-By news, it looks like the Democrats are running everything. They’re still determining the daily news narratives. They’re still pushing those. They lost. The Democrat Party is a party that’s just flailing. The Democrat Party as an electoral force has been decimated. But inside the Beltway they are the power, and they’re doing everything they can to delay and forestall Trump actually assuming control over his administration and over the government. In other words, they’re trying to deny the presidency, the full force and the full capacity of the presidency is what’s being denied to Donald Trump. And while that’s happening, here come all of these allegations and all of these attempts to force everybody close to Trump to resign or recuse or hide or whatever in total embarrassment. Now, the Sessions specifics, we went through them yesterday. I’m gonna go through them again today just to illustrate, back up the point that everything involving Sessions is fake news. We now know that it was the Obama administration that invited the Russian ambassador to the first meeting that Sessions had with the guy, and the Russian ambassador was meeting with all kinds of people. It was at the Republican convention. We mentioned it yesterday as a Heritage Foundation-sponsored event. 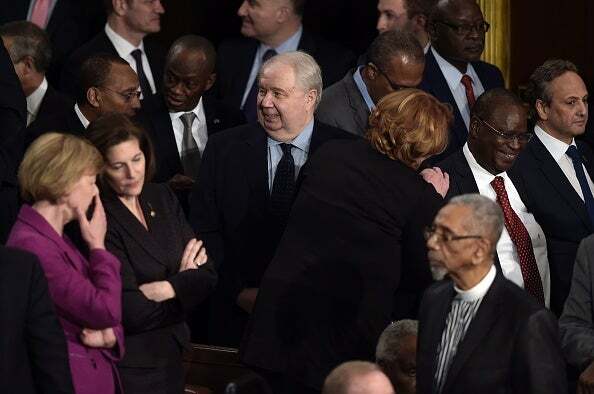 The Russian ambassador is all over the Democrat Party, he’s all over the White House. 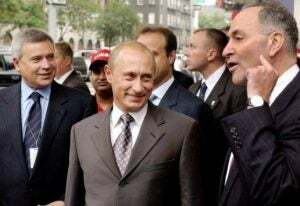 I’m telling you, if you want to find out who’s really working together to sabotage the United States, you find the link between Barack Obama, Vladimir Putin, and the Russian government. That’s the story. That’s the need. The Times says: “It is common and not improper for transition officials to meet with foreign officials. But all meetings between Trump associates and Russians are now significant as the FBI investigates Russian interference in the American election and whether anyone close to Mr. Trump’s campaign was involved.” So, you see, if they hadn’t successfully established that foundation none of the rest of this — none of this stuff on Sessions, none of this! Do you realize every bit of this originates from fake news? The fake news is that the Russians determined the outcome of the American election, everything. The Times even admits it’s common. Democrats, Republicans, Martians, everybody meets with the Russians. But because the FBI’s investigating the connection between the Trump campaign and the Russians, well, we are duty-bound to pay very special attention to every one of these contacts. It’s the biggest bunch of crap that we have seen yet, and it is only going to get bigger and bigger until somebody deals with this and exposes to the American people what’s going on. Our country is so divided that everything I’ve just told you that you have been told in one form or another for the past weeks or months, do you realize…? I would venture to say that 95% of Democrats don’t know one thing what I’m talking about. They haven’t heard one thing of this because of the media they watch. RUSH: I want to reiterate. We are witnessing — right in front of our eyes — a silent coup to unseat and render effectively immaterial Donald Trump as president of the United States. The real Russian scandal is the collusion between Barack Obama and his administration and the Russians. Obama’s team used the pretext of Russian interference in the election to justify wiretaps and illegal leaks of the Trump team, including a U.S. senator and now attorney general. What has really gone on here — and I just want to repeat what I said in the opening of the hour, ’cause it wasn’t happenstance, and I mean it. The real collusion between our government and the Russians happened with Barack Obama and Vladimir Putin and the Russians. And just to reiterate, I want you to remember some things. Just ask yourself: How far back do you have to go into the campaign before you remember hearing that Trump and Putin were buddies? Remember when Trump is getting all excited about the fact that Putin was praising him and then Trump wouldn’t release tax returns? So there became a new narrative and that is that Trump and Putin are good buddies, and this could be very bad for the United States. The way it manifests itself is Trump is such an idiot, he’s such a neophyte, he’s such an outsider, he doesn’t know things. He doesn’t understand, and he wants to sidle up to Putin just ’cause he likes Putin ’cause Putin likes him. You know, Trump’s such a sophomore. So Trump really poses a great danger because Putin doesn’t like him and Putin doesn’t like us and Putin is playing Trump for a fool and all that. So that gets the ball rolling that there’s a tie, that there’s a connection — a bromance, if you will — between Putin and Trump. And there isn’t. The real bromance is Barack Obama and the Russians. That makes more sense ideologically, it makes more sense politically, and it makes more sense historically. We know that Obama has worked with Putin on the disarming of the United States nuclear arsenal. We got Obama on tape telling Putin’s number two guy, “Be patient with me. Be patient. I’ll have more flexibility after the election.” But Obama has turned this around, the Democrats have turned this around, and they’re now saying that it is the potential danger of Trump working with the Russians. They used this “potential danger” to justify wiretaps of Trump’s team during the campaign and the transition, and this is what’s justifying this so-called illegal leaking. If the fake news were not so instantaneously and irrevocably left wing, the effort by an outgoing president to undermine his predecessor using intelligence agencies would be a bigger scandal than Watergate, because that’s what’s going on here. That’s what’s unprecedented. I mean, Truman and Eisenhower hated each other. But when Eisenhower assumed office, Truman went back to the haberdashery in Independence, and that was that. Obama hasn’t gone anywhere. He stayed in Washington, and he is running the resistance — and that, my friends, is a bigger story than Watergate could have ever been. But nobody is gonna know about it because the Drive-Bys are never gonna report it and the people that watch the Drive-Bys probably don’t even know that Loretta Lynch and Bill Clinton once met on an airplane. I don’t think they even know 90% of the stuff that you know about Obama and Hillary and the Democrat Party, ’cause the media they watch never reports it. Do a little experiment. Do you have any liberal friends that you still have peaceful relations with? Next time you get together with them… Don’t be confrontational. Just ask them. Start talking about things like Clinton meeting with Loretta Lynch a week before the election. When they start going about Sessions and how he ought to quit and Trump ought to quit, say, “Yeah, it kind of reminds me of when Loretta Lynch and Bill Clinton met one week before the FBI was gonna render a decision on the investigation of Hillary’s email. “Remember Clinton got on her plane out in Phoenix?” And they won’t know. I guarantee you they will never have heard the story. They won’t know a thing you’re talking about, odds are. Some of them might, but very few. It wasn’t reported. And to the extent that it was, remember it took a local news person to even bring that story to anywhere. A local Phoenix TV person was responsible for getting that story. You want to talk about violations of ethics and morals? Obama and the Democrats are the story and their ongoing effort to sabotage and undermine –as an outgoing president — the incoming president. Hot Air: Everyone Met with the Russian Ambassador, Let's All Panic! ZeroHedge: "This Is Either The Most Elaborate Cover-Up Of All Time, Or The Dumbest"